Virtual Villagers 4 is a simulation game played on PC created by Last Day of Work. 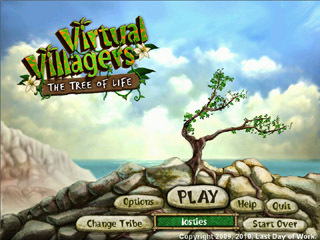 This walkthrough includes tips and tricks, helpful hints, and a strategy guide to how to complete Virtual Villagers 4.Continue the story of the mysterious island of Isola, and the tribe of lost refugees in Virtual Villagers 4 - The Tree of Life. The island's chief is worried that life is slowly diminishing on the island and has wants to solve this problem. ...... They discover, and inevitably populate, the hidden eastern shore of the island. Watch over a new group of villagers as they explore the eastern shore of the island, uncover fantastic mysteries, unravel the story of Isola, and save the Tree of Life!We return to the island of Isola, where many generations of castaways have lived happily and peacefully. However, life on the island has begun to diminish; birds and fish are slowly disappearing. An expedition is set out to investigate the cause of this worrying phenomenon. The expedition stumbles across a clearing with an enormous dying tree. This must somehow be the answer to their problem! Help the castaways find out what is causing the tree to die and rescue it. - The latest chapter in the Virtual Villagers saga! - Visit the oldest and most hidden part of the mysterious Island of Isola. Qweas is providing links to Virtual Villagers 4 The Tree of Life 4 as a courtesy, and makes no representations regarding Virtual Villagers 4 The Tree of Life or any other applications or any information related thereto. Any questions, complaints or claims regarding this application Virtual Villagers 4 The Tree of Life 4 must be directed to the appropriate software vendor. You may click the publisher link of Virtual Villagers 4 The Tree of Life on the top of this page to get more details about the vendor.